A garden, while associated with the natural world, is actually a human creation. A place where humans exert control over nature’s chaos. In war, the human need to control what is utterly chaotic and unnatural is amplified. In extreme combat, citizens and soldiers often make what scholar Kenneth I. Helphand calls defiant gardens. These defiant gardens are an adaption to challenging circumstances – a response to a basic need, an aid to survival, but also an assertion and an affirmation of life. The assertion of humanity amid brutality is the story that Houston artist Dario Robleto attempts to create in his “Defiant Gardens,” a seven foot tall, five foot wide wreath-shaped “memory sculpture” that bursts forth at MCA/Denver in the exhibition, An Instinct Towards Life. A memory sculpture , not precisely a memorial, displaces past into presence. 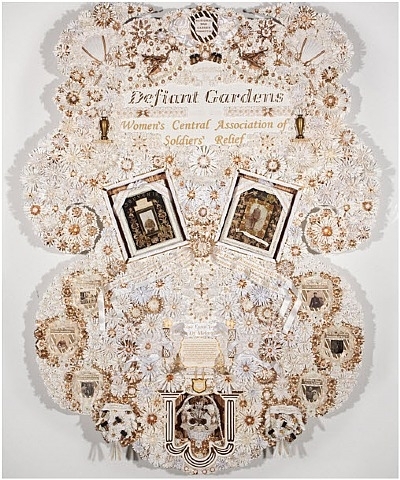 “Defiant Gardens” is a flowering of decorative objects and forms and includes artifacts of war like the skeleton of a carrier pigeon, shrapnel, a message capsule carried by pigeons. Read the rest of the story and see images of the work on adobeairstream.com. ← Don’t Blink Or You’ll Miss Electronic Art at Denver Art Museum!